The Black Friday/Cyber Monday 2017 Week promises several exciting carpet cleaner machine deals. On this page, we list popular carpet cleaner models that will most likely be discounted based on our observations. This could be for specific Black Friday/ Cyber Monday deals or products with attractive discounts. Deals come and go, especially Lightning Deals, so please check price and availability on the vendors/merchant’s website (eg. Amazon). Very highly rated and popular unit that cleans extremely well. 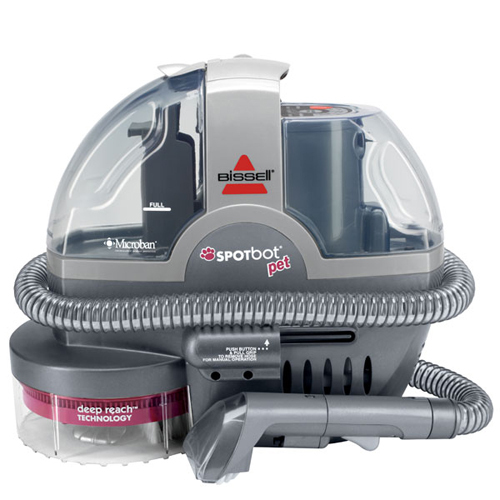 It’s suitable for general carpet cleaning and spots and stains cleaning (including pet stains). It’s light in weight compared to other full-powered upright cleaners, features an updated and more streamlined design and a rinse-only mode for removing detergent from carpets. To learn more, read the review. 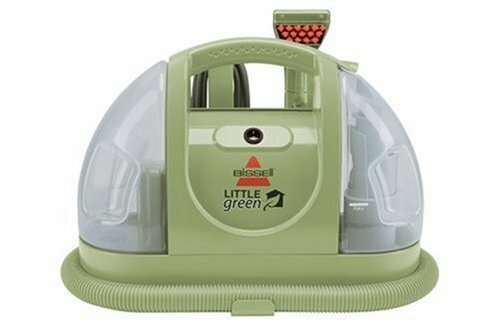 The Bissell Big Green Deep Cleaning Machine 86T3/86T3Q is a professional grade machine recommended for serious home users. It is similar in build and quality to rental cleaner machines, and said to outperform the Rug Doctor cleaners you can rent at grocery stores. It offers the best cleaning results for a home carpet cleaner, along with the most trouble-free experience there is for a home-use model. To learn more, read the review and why choose professional grade article. This popular slim portable carpet cleaner is easy to carry around and can be used for cleaning up spots, stains, upholstery and auto-interiors. This is a portable cleaner that incorporates Bissell’s Heatwave Technology for more consistent water temperature when using hot tap water. Learn more at Amazon. The Bissell PowerLifter PowerBrush Upright Deep Cleaner 1622 is a lightweight cleaner that is closest in design and cleaning performance to a regular-grade deep cleaner. It is a smaller lightweight upright machine suitable for cleaning rooms and homes. Read the review. This model, the Bissell Premier Pet 17N4, has been spotted on sale. Cost-effective Bissell carpet cleaner with 12 rows of Dirtlifter brushes and pet hair basket. To learn more, read the review. Handy and lightweight cleaner for spot cleaning. This is an older Bissell portable carpet cleaner model, but it used to be very popular and works well. Due to its size and portability, some customers like to use this for cleaning their auto interiors. To learn more, read the review. Automated cleaning for spots and stains. You can set the cleaner over a stain and then let it get to work while you step off to do something else. This is a popular cleaner and hardly on sale. To learn more, read the review. Check if Walmart has a special offer. Here, we share some of our experiences with Amazon Black Friday/Cyber Monday Sales Events. This is based on our experiences only and the rules and circumstances change with time, so please stay alert and use your common sense. Lightning Deals – Deals the come and go quickly, usually within a period of 1 to 4 hours. Usually, they are announced randomly throughout the day in the Today’s Deals section under the heading “Today’s Lightning Deals and More.” If you are vigilant, you can catch an upcoming sale ahead of time and get yourself ready to claim it when it starts. Hot Black Friday/Cyber Monday Price Drops and Top Deals – These are time limited special price drops that stay for a few days. You can find out a listing for them in the Amazon Today’s Deals/Black Friday/Cyber Monday sections. Locking in a Lightning Deal ahead of time – This method will likely work if you are standing by to purchase at the start of the deal. It’s one way to ensure you get an Amazon.com lightning deal in high demand and with limited quantities. Place the item in your shopping cart just ahead of the deal. That means that before the deal starts, you should already have the item in your cart. In our experience, the discount should be applied to your item in the cart the moment the Lightning Deal starts. From this point on, you have a short amount of time (eg. 10 to 15 minutes) to officially claim the deal, ie. purchase it. Please double-check that the steep discount is there before you pay. Unclaimed deal items go back to the general pool or to the waitlist. Other Price Drops – Sometimes, a machine may receive a price drop, without being a Black Friday/Cyber Monday/Sales Special, and coinciding with a Holiday sales period. Nobody knows how long the low price will stay. The price of carpet cleaners fluctuate over time. Please always check the price before you pay up, don’t just assume it’s the same as you last saw it listed.